The VOICE Refugee Forum is an independent network of political refugee activists. Founded in 1994 in a former camp in Mühlhausen in Thüringen as exile organisation (The VOICE Africa Forum), The VOICE nowadays supports and promotes the empowerment of refugees and the self-organisation of refugee groups nationwide . Our main goals remain the struggle for equality, justice and human dignity for every refugee in Germany. With a strong affirmation that “We are here because you destroy our countries” we seek to collaborate with groups and initiatives on the basis of solidarity and justice, and we reject any form of paternalism, co-optation and continued colonial injustice. Our emphasis is rooted in the principles of grassroots mobilisation and empowerment and inbuilding refugee political communities and networks. We remain opposed to the deadly migration politics by the European and other Western powers, and their brutal border regime and racist practices of oppression and exploitation. Therefore our work is always located in the context of resistance against colonial injustice. The VOICE Refugee Forum ist ein unabhängiges Netzwerk politischer Flüchtlingsaktivisten. 1994 in einem früheren Flüchtlingslager in Mühlhausen in Thüringen als Exilorganisation gegründet (The VOICE Africa Forum), unterstützt und fördert The VOICE Refugee Forum heute die Selbstermächtigung und Selbstorganisation von Flüchtlingen bundesweit. The VOICE hat in seiner Geschichte zahlreiche öffentliche Protestaktionen und Kampagnen für die Freiheit politischer Gefangener in unseren Heimatländern und gegen Umweltzerstörung und Ausbeutung durch multinationale Konzerne durchgeführt. Wir organisieren uns im Protest gegen Kriminalisierung, Racial Profiling, Polizeigewalt (Kampagne für Oury Jalloh), diskriminierende Gesetze und soziale Ausgrenzung und verteidigen uns gegen institutionellen und gesellschaftlichen Rassismus. Im Zentrum unserer politischen Aktivität steht der Protest gegen Abschiebungen, für die Abschaffung der Residenzpflicht und für die Schließung der Isolationslager für Flüchtlinge in Deutschland. Unsere Aktionsformen beinhalten Kundgebungen, Mahnwachen, Demonstrationen, Internetaktivismus und öffentlichkeitswirksame Veranstaltungen. Beispiele sind die bundesweiten Karawane-Touren (1998 bis 2007), der Karawane Flüchtlingskongress 2000, das Karawane-Festival 2010 (beide in Jena) und das Break Isolation Refugee Camp 2012 (Erfurt). Diese Beispiele stehen auch für die enge Zusammenarbeit mit dem Netzwerk der Karawane für die Rechte der Flüchtlinge und MigrantInnen. Unsere wichtigsten Ziele bleiben der Kampf für Gleichheit, Gerechtigkeit und Menschenwürde für jeden Flüchtling in Deutschland. Mit der starken Beteuerung “Wir sind hier, weil ihr unsere Länder zerstört” suchen wir die Zusammenarbeit mit Gruppen und Initiativen auf der Basis von Solidarität und Gerechtigkeit und weisen dabei jede Form des Paternalismus, der Kooptation und der Fortsetzung kolonialen Unrechts zurück. Unser Schwerpunkt wurzelt in den Prinzipien der Graswurzelmobilisierung, der Praxis des Empowerments und im Aufbau von politischen Gemeinschaften und Netzwerken von Flüchtlingen. Wir positionieren uns gegen die tödliche Flüchtlingspolitik der europäischen und anderer westlichen Mächte, gegen ihre brutalen Grenzregimes und die rassistischen Praktiken der Unterdrückung und Ausbeutung. Somit ist unsere Arbeit immer im Kontext des Widerstands gegen koloniales Unrecht lokalisiert. What does The VOICE continuously stand for? Our aim includes supporting refugees and asylum seekers in defence of their rights in Germany. In addition, we encourage and support human rights activists in their struggle to ensure the respect of their rights back in their home countries. We are critical on the advancing and promoting victim’s self-organisation to achieve the above stated aims amongst others. The violation of human rights that prompted persons to flee their countries is unfortunately continued here in Germany where they sought refuge. Living as a refugee in Germany means denial of the basic human rights to freedom of movement and association. In other words, to live in inhuman conditions of poverty, fear, intimidation, imprisonment, social exclusion and several unjust abuses amidst institutional and societal racism. For many years, refugees have continued to suffer from isolation in remote camps located in the forests far from the city and exposed to bad hygienic conditions, heteronomous feeding with food packages or voucher system and denied of real medical attention in most cases. They are confronted with discrimination and racism on a daily basis with no possibility of recourse to justice. The so called "Residenzpflicht" forbids asylum seekers to leave their local district without a written permission from the foreigners’ office. This permission is always arbitrarily denied when refugees ask for it. The "Residenzpflicht" prohibits refugees from engaging in social contacts, visiting friends and relatives and engaging in cultural and political activities that are in actual sense the basic human needs. A violation of the "Residenzpflicht" is regarded as a criminal offence against the German state thus positioning Refugees as potential Criminal as just a single visit to a friend in the next district can be a crime. Uncountable numbers of refugees are traumatised, owing to what they have suffered in their home countries which has continued through the inhuman conditions they are compelled to live with in Germany. The social isolation of refugees in Germany and the verbal-physical racist attacks from day to day place refugees in a state of permanent psychological trauma. The mental-psychological traumas accompanying permanent deportation threat has led many refugees to commit suicide. Refugees are practical victims of a Europe-wide system of exclusion and internment in camps and deportation prisons in and outside Europe - e.g. in Africa, with the terrifying aim to keep refugees away from Germany. Exercising the basic human rights is made difficult or denied completely through these conditions of Isolation and Exclusion. The right to development of human personality, freedom of movement, education, socio-cultural and political association, human dignity and even the right to live are simply not meant for refugees in Germany. The VOICE Refugee Forum initially known as The VOICE Africa Forum was founded in 1994 in the Forest Reception Lager in Mühlhausen Thüringia. The then focus of this organisation was on the exposure of dictatorship in Africa. Over the years we have campaigned against the German Apartheid Residenzpflicht, Police brutality especially racist Police Brutality, deportation and other horrific situation of refugees in Germany and Worldwide. We have worked endlessly in co-operation with other refugee support groups, human right groups and individuals to support and promote the rights of refugees in Germany. Our activities are centred on empowering refugee self-organisation and determination in exercising their rights. The VOICE Refugee Forum is part of founding initiatives of The Nation-wide Network of The Caravan for Rights and Migrants. - Regular support of refugees to overcoming isolation through creating a platform for them to share experiences and to promote their self organisation through provision of the necessary logistics like; transportation and communication materials amongst others. - Supporting refugee’s political engagement as respect for human rights in their home countries as well as in Germany. - Exposing information on the difficult situation of refugees in Germany through publications, public seminars and cultural programs as well as soliciting concrete solidarity devoid of paternalism. - Supporting refugees in their asylum processes and legal cases connected to their status i.e Residenzpflicht, discrimination, deportation etc. through counselling and legal support. - Organising proper documentation and archiving of refugee activities and history. The VOICE Forum does not receive public money. Members are mainly refugees and asylum seekers with little or no fund. We depend on individual and private donors for support. Consistent donations no matter how small promote long term planning possibilities but single donations are also welcomed. Donations are tax deductible and receipt could be issued at request. We, The VOICE Refugee Forum, are groups of human rights activists that have been actively engaged publicly in protesting the inhumane situation of refugees since 1994 in Thueringen and Germany as a whole. The members are actively engaged in supporting persecuted human rights activists here in Germany and in their home countries. We are informed about the difficult living conditions of refugees in Germany and the human rights situation in their home countries. read below in english, dt, frz. 1. Protesting human rights abuses in the home countries of refugees/migrants and in Germany. 3. Against the social exclusion of refugees and migrants. 4. Against the daily racism by the authorities and the public. 5. Against racist controls and police brutality on refugees and migrants. 6. For the abolition of deportation prisons and detention centres/camps. 7. For the universal rights for freedom of movement which is violated in Germany by deportation and deportation threats, and by the imposition of the so-called "Residenzpflicht", the restriction of the movement of refugees to their "landkreis" or local districts. 9.For the Promotion of the living conditions of refugees in Germany. The daily lives of refugees are designed by isolation and social exclusion with the permanent threat of deportation. Since the foundation of The VOICE Forum in October 1994 in Mühlhausen in East Germany, hundreds of thousands of refugees and migrants have been deported from Germany without political or humanitarian consideration. More than five years ago when the preparations for the refugee congress organised amongst others by the Caravan for the Rights of Refugees and Migrants in Jena in Spring of 2000 was obstructed by the so-called Residenzpflicht law, the residential restriction for asylum seekers, our organisation decided to start a campaign for the abolition of this humiliating Law in Germany that violates our human rights. This obligation is put down in paragraph 58 of the Asylum Procedure Law (Asylverfahrensgesetz). The interpretation is to the effect that during the asylum procedure for the recognition as a refugee, asylum seekers are allowed to leave the district they have been assigned to with the permission of the Foreigners’ Office ONLY. Since 1982, which is more than 20 years, the residential obligation law has been restricting the freedom, personal and political rights of thousands of asylum seekers prejudicially. ”Residenzpflicht” criminalizes and discriminates. It makes refugees the object of humiliating racist controls and puts them under psychological and material pressure. The Residenzpflicht law entails the persecution of refugees with fines or prison sentences for up to 18 months and the indiscriminate threats of deportation are enormous. The daily restriction of movements without choice of settlement violates our freedom and basic rights as minority groups and groups of refugees and migrants. A law like this is unique in Germany within Europe. Our inevitable campaigns for the abolition of the residence obligation law did create the awareness of the ill sufferings and the abuses in our every day lives, due to the abolition campaign some of the cases against “das Residenzpflicht” in the courts have been dropped or won against the State Public Prosecution Officers and against the authorities in the recent years of the protest in Germany. We demand freedom of movement for everybody everywhere. We demand the abolition of the ”Residenzpflicht” which isolates, excludes and criminalizes refugees in Germany. Germany is the only country in Europe where refugees are criminalized by the law of the movement restriction (Residenzpflicht). This law shows that refugees in Germany are meant to be socially isolated, not only being kept in far away camps in the middle of forests, also the restriction of movement by the “Residenzpflicht” law excludes refugees from the mainstream societies not allowing them to mix with the general populace, fellow refugees and migrants who may be living in other cities. The movement Restriction law keeps refugees from seeing their doctors, their lawyers, their friends and relatives and for some of them worst of all from continuing the political activities that made them flee their country in the first instance. The government law is gagging us in a way. Thus the Movement Restriction pass-law (Residenzpflichtgesetz) for refugees violates article 13 of the Universal Human Rights Declaration (Freedom of Movement) as well as article 1 of the German constitution and article 2 paragraph 1 that guarantee the right to human dignity and the right to development of the human personality respectively. Also the right to assemble is highly restricted with this law. Our work to promote the living conditions of refugees and migrants in this country are not without its negative consequences. We face State intimidations and repressions with deportations and many of us being under deportation threats. The restriction of movement law ( das residenzplichtgesetz) or call it the residence obligation law is being used as a weapon to hinder or stop altogether our political engagements. The new Immigration law has actually been serving the intentions of its originators as a law to hinder migration into Germany and to increase the expulsion of those already here, especially those seeking refuge from persecution and natural disasters and war. a. The virtual removal of asylum rights. b. Construction or commissioning of more deportation centres and prisons. c. Total defiance and disregard for the rule of law by many State Interior Ministers and disregard for both International laws and human rights. d. Spreading apathy and psycho-torture among asylum seekers and people without papers. e. Perforating justice, increasing the integration and expanding the contributions of the law courts in the deportation machinery. f. The word “Bundesamt for migration” is a wrong connotation. It is a government agency that initiates deportation rather than manage migration. g. The percentage of accepted asylum seekers makes the Bundesamt and the district courts a laughing stock in the eyes of the world, and making nonsense of the asylum procedure. There are numerous concrete evidences that prove that deported asylum seekers face persecution, torture, indefinite detention, imprisonment, death or even suicide. In some cases some of them have been lucky to escape from prison and live in hiding in neighbouring countries, living in constant fear without future prospects, always on the run. The recent “Gestapo styled” deportation to Togo of Alhassane Mousbau in January 2006 is a typical example. The German government is yet to take full responsibility for the consequences of its action. We demand a general stop to all deportations. We demand the respect and recognition of the human rights and dignity of all asylum seekers. We demand residence permit devoid of any restriction for all and the opportunity to integrate into the society. We demand freedom of movement for everybody everywhere. We demand the abolition of the ”Residenzpflicht” which isolates, excludes and criminalises refugees in Germany. We demand an end to racist police controls, police abuse and brutality of refugees and migrants all in the name of the “Residenzpflicht” law. The right to asylum has witnessed gradual erosion over the past decades and it is gradually being extinguished. “A right once extinguished may never be regained”. We demand full restoration of this right not only for our purpose today but for future generations and for posterity. " Those who fail to condemn evil, commit it to be done". The burning to death of our comrade Oury Jalloh in a Police cell in Dessau and the cover up by the state to bring to book the blood tasty barbarians responsible for this ominous act. In the same way we would not forget the murder of Laye Konde in Bremen through the forced and criminal administration of chemical agents on him. The two actions in our view were carried out with impunity and total disregard for the lives of refugees. Mouktar Bar, one of the leading persons calling for justice in Oury Jalloh’s case is presently being persecuted by the state in one guise or the other. The perpetrators of these heinous crimes are undaunted and appear to be “untouchables”. Is this how democracy operates in 21st Century Germany? We will reiterate once more that “those who do not condemn evil commit it to be done”. We demand justice in these cases and demand that the German government put an end to the atrocities committed against us all " in the name of the Law". We want to be seen and heard as the human beings we are and not as some strange creatures from some strange continents. The dignity of man is non negotiable and must be upheld in all cases. Wir, The VOICE Refugee Forum, bestehen aus Gruppen von Menschenrechtsaktivisten, die seit 1994 aktiv engagiert sind, in der Öffentlichkeit die inhumane Situation von Flüchtlingen in Thüringen und ganz Deutschland anzuprangern. Die Mitglieder engagieren sich aktiv für verfolgte MenschenrechtsaktivistInnen und gegen die Verletzung von Menschenrechten hier und in ihren Heimatländern. Wir informieren über die schwierigen Lebensbedingungen von Flüchtlingen in Deutschland und die Menschenrechtslage in ihren Heimatländern. Das Forum wurde ursprünglich als "The VOICE Africa Forum" von Afrikanern in Thüringen gegründet. 1. Im Protest gegen Menschenrechtsverletzungen in den Heimatländern der Flüchtlinge und MigrantInnen und in Deutschland. 2. Gegen Abschiebung und die Bedrohung von Flüchtlingen und MigrantInnen durch Abschiebung. 3. Gegen die soziale Ausgrenzung von Flüchtlingen und MigrantInnen. 4. Gegen den täglichen Rassismus durch Autoritäten und die Öffentlichkeit. 5. Gegen rassistische Kontrollen und Polizeibrutalität gegen Flüchtlinge und MigrantInnen. 6. Für die Abschaffung von Abschiebegefängnissen und Internierungszentren und -lagern. 7. Für das universale Recht auf Bewegungsfreiheit, das in Deutschland durch Abschiebungen und Abschiebeandrohungen und die Auferlegung der sogenannten "Residenzpflicht", die Beschränkung des Aufenthalts von Asylbewerbern auf den ihnen zugewiesenen Landkreis, verletzt wird. Der Alltag von Flüchtlingen ist geprägt von Isolation und sozialer Ausgrenzung verbunden mit der steten Bedrohung durch Abschiebung. Seit der Gründung von "The VOICE (Africa) Forum" im Oktober 1994 in Mühlhausen/Thüringen (seit 1998 im Netzwerk der "Karawane für die Rechte der Flüchtlinge und MigrantInnen") wurden Hunderttausende von Flüchtlingen und MigrantInnen ohne politischen oder humanitäre Abwägung von Deutschland abgeschoben. Stoppt die Abschiebungen! Abschiebungen sind Menschenrechtsverletzungen. Folglich sind sie ein Verbrechen. Die deutschen Behörden müssen verantwortlich gemacht werden für die Konsequenzen dieser Abschiebungen und Abschiebeandrohungen, die oftmals absolute Verzweiflung und Frustration, Repression und Tod bedeuten; das gilt für die Flüchtlinge und MigrantInnen sowohl hier in Deutschland als auch nach ihrer Abschiebung, die für die Abgeschobenen Gefängnis, Verfolgung, Folter oder Tod heißt. Wenn wir abgeschoben werden, schickt man uns zurück in dieselben Länder, welche zerstört und jeder Zukunft beraubt wurden. Und wie zu Beginn des Kolonialismus werden wir behandelt wie Tiere - nicht wert der westlichen Ideale wie Freiheit, Gerechtigkeit und Demokratie. Wir werden in Käfige (Heime, Ausreisezentren und Abschiebegefängnisse) gesperrt, welche ihnen nicht gut genug für ihre Hunde sind. Sie erwarten von uns, dass wir diese Ungerechtigkeit ohne Beschwerden akzeptieren und dass wir dankbar sind für ihre vorgebliche "Großmut". Sie erwarten von uns Lob für die USA, die EU-Regierungen, die WTO, IWF, Weltbank und NATO iom und usw. für den "Versuch uns von Armut und unserer schlimmen Situation zu retten" - die diese uns auferlegt haben. Bewegungsfreiheit jetzt! Schließt alle Abschiebelager und Abschiebeknäste! Schluss mit den Abschiebungen und Residenzpflicht-Beschränkungen für Flüchtlinge in Deutschland! Eure kontinuierliche Unterstützung und euer Engagement in Solidarität mit den unterdrückten und verfolgten Flüchtlingen und MigrantInnen in Deutschland bleibt unerlässlich für unsere tägliche Arbeit und für eine bessere Situation von Flüchtlingen und MigrantInnen im Allgemeinen. Wie für alle ehrenamtlichen Organisationen gilt auch für uns: Es sind eure Spenden, die unsere Arbeit am Laufen halten. Bitte spendet heute um den Widerstand aufrechtzuerhalten und morgen eine bessere Welt aufzubauen. Spenden für Kampagne, Transport, Mobilisierung and Besuch in Flüchtlingsheim/lager, Druckkosten, Organisation und die Durchführung von Treffen und Veranstaltungen werden uns höchst willkommen sein. Tel. : 0049 (0) 3641 665214. Fax. 0049 (0) 3641 420270 E-mail. : voice_mail@emdash.org. Wir wuenschen euch ein gutes neues Jahr! 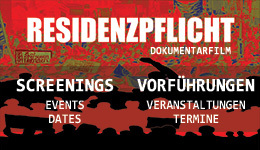 Protestiert gegen Repression hier und �berall sonst! We, The VOICE Refugee Forum, are groups of human rights activists that have been actively engaged publicly in protesting the inhumane situation of refugees since 1994 in Thueringen and Germany as a whole. The members are actively engaged for persecuted human rights activists in their home countries. 5. Against racist controls and police brutality against refugees and migrants. deportation and deportation threats and by the imposition of the so-called "Residenzpflicht", the restriction of the movement of refugees to their "landkreis" or local districts. The daily life of refugees is designed by isolation and social exclusion with the permanent threat of deportation. Since the foundation of "The VOICE Forum in October 1994 in Mühlhausen in East Germany, and (since 1998 that we joined the network of The Caravan for the rights of refugee and migrants) hundreds of thousands of refugees and migrants have been deported from Germany without political or humanitarian consideration. Stop the deportations! Deportation is a human rights abuse. So it is a crime. The German authorities must be held accountable for the consequences of these deportations and the deportation threats which often led to absolute desperations and frustrations with repressions and death of the refugees or migrants here in Germany and after their deportations, including the imprisonments, persecutions, tortures or death of those deported. When we are deported, we are sent back to the very lands that have been destroyed and raped of any future. And like when colonialism began, we are treated like animals not worthy of the so-called Europeans ideals of liberty, freedom and democracy. We are placed in Cages (Heims, Ausreisezentrum or deportation prisons) which they do not consider good enough for their dogs. They "wisely" expect us to accept this injustice without complaints and be grateful to them for their purported "magnanimity". They expect us to praise the U.S.A and European governments, WTO, IMF, World Bank, NATO, IOM and etc. for "trying to rescue us" from the poverty and ugly situation they imposed on us. Free Movement Now! Close all detention and deportation centers! Stop the deportations! Abolish the"Residenzpflicht" restriction of refugees to local districts in Germany! Your continuous support and committment in solidarity with the oppressed and the persecuted refugees and migrants in Germany remain indespensable for our daily work and for the better situation of refugees and migrants in general. Donations towards campaigns, transportation, mobilisation, visit to refugee camps and printing cost, organisation and realisation of the meetings and events with refugees and migrants will be highly welcomed. Protest repression here and anywhere else! Tel. : 0049 (0) 3641 665214. E-mail. : voice_mail@emdash.org. The VOICE Refugee Forum-un réseau de réfugiés politiquement engagés. Nous, the Voice Refugee Forum , sommes un groupe d´activistes pour les droits de l´homme engagés publiquement dans la contestation des conditions des réfugiés dans le Thueringen depuis 1994 et en Allemagne en général.Les membres sont politiquement engagés pour lutter contre la persécution des activistes des droits de l´homme dans leurs pays d´origine. nous nous enquérons des conditions de vie difficile des réfugiés ici en Allemagne et dans la situation des droits de l´homme de leurs pays respectifs. 1.Protester les abus de droits de l´homme des pays d´origine des réfugiés et en Allemagne. 2.contre les déportations et menaces de déportation des réfugiés et émigrants. 3.contre l´exclusion sociale des réfugiés et émigrants. 4.Contre le racisme quotidien des autorités et le public. 7.Pour le droit universel de la libre circulation qui est violé en Allemagne par le biais des déportations et menaces de déportation et de l´imposition de la "Residenzpflicht", la loi sur la restriction des mouvements des réfugiés dans un district bien défini connu sous le nom de "Landkreis". Le quotidien des réfugiés se contourne autour de l´isolation et l´exclusion sociale avec pour menace permanente une déportation en vue. Depuis la création du "The VOICE Forum" en Octobre 1994 à Mühlhausen en Allemagne de l´Est, et depuis 1998 que nous avons joint le réseau de la Caravane pour les droits des réfugiés et des émigrants des centaines de milliers de réfugiés ont été déportés de l´Allemagne sans considération politique et humaine. Arrêtez les déportations! La déportation est une violation des droits de l´homme, donc un crime. .Ils espèrent de nous, de rendre honneur aux Etats-Unis et les gouvernements européens, OMC, FMI, Banque Mondiale, OTAN, IOM etc... dans leur tentative de venir "à notre secours"afin de nous libérer de la pauvreté et des situations horribles qui nous imposent. Maintenant la liberté de Mouvement! Fermez tous les centres de détention et de déportation! Arrêtez les déportations!Abolissez la « limitation de Résidence » la restriction en Allemagne des districts locaux des réfugiés! Votre support quotidien et engagement avec les oppressés et émigrants en Allemagne restent indispensables pour le travail au jour le jour et pour une meilleure situation des réfugiés en Allemagne en général. Etant une organisation faite de volontaires, vos donations sont celles qui nous maintienent. S´il vous plaît faites des dons afin de préserver la résistance et pour la mise en place d´un demain meilleur. Les dons à travers les campagnes, transports, mobilisation, visites aux réfugiés dans les camps et imprimeries, l’organisation et la réalisation des réunions et évènements avec les réfugiés et émigrants sont la bienvenue.